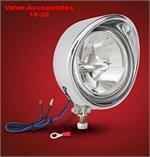 Visored 3 1/2" LED Lights. 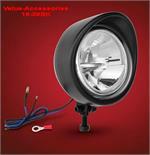 LED Driving Light that’s more than double the illumination of those in the marketplace. What is even more surprising is such great photometrics in a 3 ½’’ light. This new Focus™ Driving Light projects a true driving light beam pattern to over 1000 feet,utilizing market leading CREE LEDs with a true white 6000K. Big Bike Parts 3 ½’’ visored light housing is a proven market leader. The new Focus Driving Light sets the standard for future driving lights and its 8mm stud makes it an easy retrofit to almost any existing light kit currently installed and will be offered by BigBike Parts with their numerous light kits. These lights are high quality.